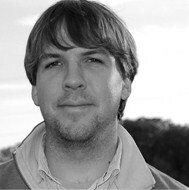 A lifelong Illinoisan, Andrew Galligan studied writing at Bradley University and Northwestern University. His work was twice nominated for AWP awards at Northwestern, has appeared in the Susquehanna Review, Spectrum, and Sonora Review, and was recently named a finalist for the Gwendolyn Brooks Poetry Award. He works for a medical device company in suburban Chicago, where he lives with his wife and daughter. clear: I have lived like a licked popsicle. Cranked cotton candy from blue raspberry ears. Fallen always before bodies, felling temples - a skin arsonist. Now a simmering fraction. Anchored and ropeless and tongued-over. What's lost are the steel drums of day sweat. and I will still feel the shower running me down. I will peel back the demagnetized rind. I will sit myself in a circle and answer the tough questions.